Divine celebration: not since Dyonisos include wine and party together! The Greek God of wine, the grapes, of joy, of madness and Ecstasy would have his pleasure at her party in a location which is specialized in wine. Find it in the following list. 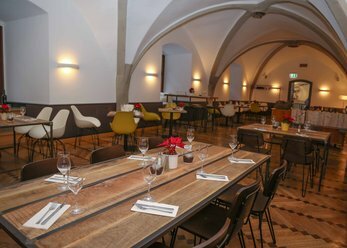 Restaurant and wine bar - the location connects approximately 800 years history of the old of court in the Centre of Munich with best wines, indulgence and hospitality. Our rooms for 25-250 persons are located in Prime inner city location. Public transport and parking in the direct vicinity. 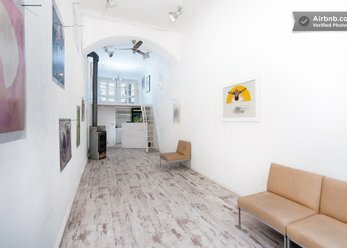 Exclusive event location, two-storey with a gallery for private or business events. We offer an all around carefree package with catering and entertainment for 30 to 350 persons, sitting or standing. With open space and water basin in front of the location, close to train station and Center. 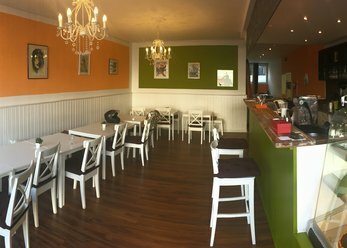 The location is a small vegan restaurant in Schwabing West. We have a guest room, a sun terrace and a detachable seminar room with a projector. Our location between Luitpold - and Olympic Park is perfect for seminars with natural exercises or simple relaxation during breaks. In our Café at the Gärtnerplatz, we pamper our guests with fine Italian dishes and wines since 2012. The ideal location for a nice celebration with friends, family or colleagues. The light-filled loft Gallery and 6 ceiling Windows has an international flair by the extravagant architecture. There is a high-quality and modern kitchen and two bathrooms, two bedrooms, and a dressing room. 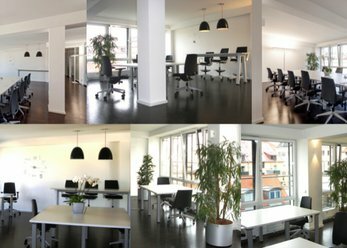 The location is the central meeting point for creative work in the middle of the Centre of Munich close to the main railway station. Anyone looking for a desk, meeting or seminar rooms or an event location, easily checks for us. A special event location. 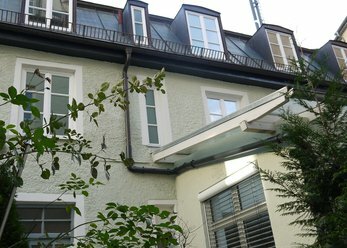 Located in the heart of Munich, in the trendy district of Glockenbach, a former carriage passage from which is 18 century... An ideal place for a reception, a presentation or a corporate event. 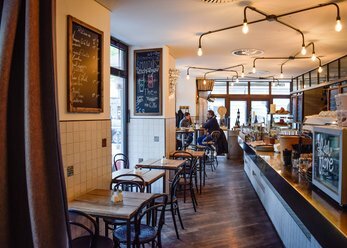 Fine wines in the metropolis of hops: the city of Munich is not only to the Oktoberfest known for their beer and the desire of the Munich-based, whenever possible, to a party. Reconstructed huts, basement bars, rooms in the youth information centre or in a youth club or other party rooms: event locations is great for a party in Munich. For lovers of fine drop it can be sometimes something more difficult to find a great party venue that offers a wide range of wines. Because sometimes it should be something special, if you want to wine lovers come together and the party in a sign of the delicate drop. 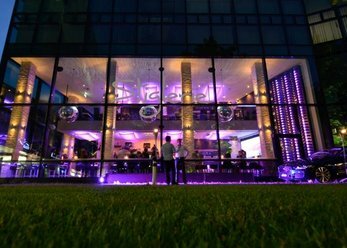 A popular location in the Munich area is the event location Mikeš, that has a wine bar and include in addition to the top anger Theater several other locations. 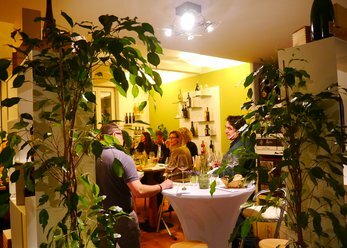 Their popularity has succeeded: today, there are more and more locations in Munich, which await you with a selected range of wines and bottled wines from all over the world and at the same time have a party room. Some offer exquisite House wines top wines and a selection of wines. Even if it does not always equal a Château Lafite Rothschild must be the times in which wine was only a luxury good, which combines 5-course - menu or a tasteful tasting a man only with a romantic candlelight - dinner, during beer and high-alcohol The parties were associated with spirits, are over. Why not own party after approved out dancing with friends different varieties of noble liquid taste! Or after a tiring meeting wine the evening leave with colleagues at a party and some good glasses. The following list helps you to find party spaces in the field 089, offering an extensive wine list.